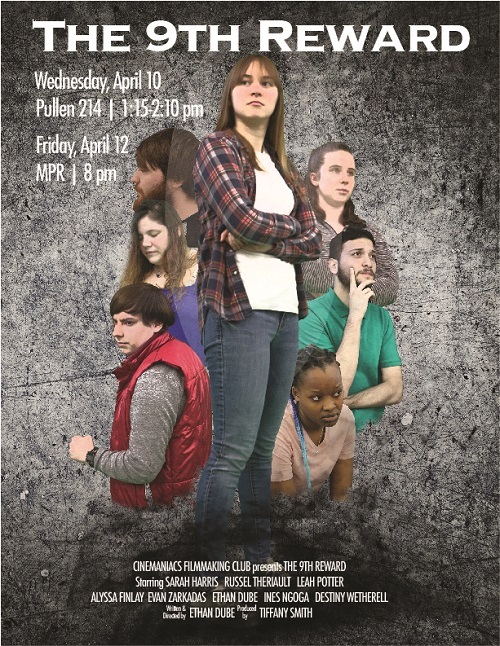 The University of Maine at Presque Isle’s Cinemaniacs Film Club will present The 9th Reward, an original student film, during two special screenings this spring. The first showing will be held during University Day activities on Wednesday, April 10 at 1:15 p.m. in Pullen Hall room 214. The second showing will take place on Friday, April 12 at 8 p.m. in the Campus Center, on the big screen in the St. John and Aroostook Rooms. This second screening will include a Q&A with the cast and crew following the film. This film is PG-13 and the content may not be suitable for younger viewers. The screenings are open to the public with a $5 suggested donation; UMPI students enjoy free admission. 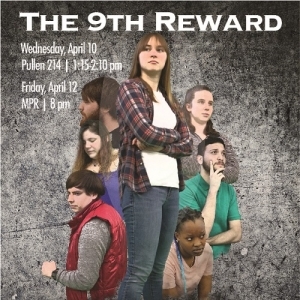 The 9th Reward was written and directed by UMPI senior Biology major Ethan Dube and produced by UMPI junior English major Tiffany Smith. The film, approximately 45 minutes long, stars UMPI students Sarah Harris, Destiny Wetherell, Evan Zarkadas, Leah Potter, Ines Ngoga, Ethan Dube, Alyssa Finlay, and Russel Theriault. The film’s premise is simple—after awakening trapped in a strange room, Robin is forced to choose between three doors—but it gets much more complicated from there. Robin is told to earn “The 9th Reward” by playing a nefarious game… or die trying. Smith explained that bringing the film from idea to reality was challenging. On top of the intense filming schedule, one of the actors dropped out on the first day of filming, so Dube had to replace him as the actor—“which was difficult because I was the director and one of the camera operators,” he said. Still, the filmmakers are pleased with the end result. All are encouraged to attend the screening events. To view the film trailer, visit https://www.youtube.com/watch?v=KerEPtI9thA. For more information about the screenings and the film, contact Smith at tiffany.a.smith@maine.edu.